Small rectangular tray made of natural pine with handles. Useful interior measurement of tray 30x15x3 cm. Basket or tray to keep the products of the baby of the house. Size 30 x 22 x 10 cm. Pine box tray with handles. Available in 2 different sizes. Solid pine trays varnished in walnut to give a more rustic touch. Total measurement 57x40x10,5 cm. interior measurement 55x38x9 cm. 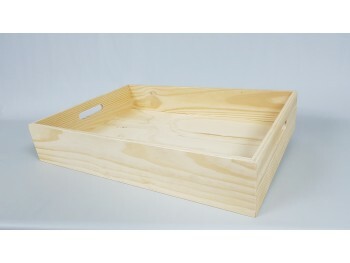 Large trays made of solid pine, resistant and very comfortable Total measurement 57x40x10,5 cm. Interior 55x38x9 cm. 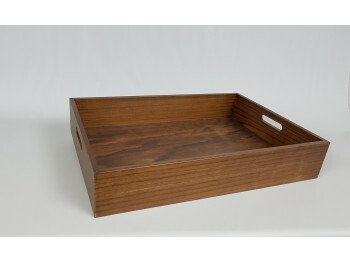 Box tray in solid natural pine wood unvarnished, with handles and rounded corners. Prepared to paint and varnish if desired. It is 1.2 cm thick. Measure 60x40x14 cm. . If you want to add an engraving to your box select add engraving to this product. The engraving for this article would be done inside. Box made of solid pine wood Pefc certified natural unvarnished, with handles and rounded corners 1.2 cm thick. They are stackable. Product from sustainable forests. External measurements 30 x 30 x 30 cm. Wooden boxes with handles made of solid pine wood PEFC certified sustainable forests, sold in natural unvarnished. They have rounded corners and are stackable. Available in 2 sizes Small 40 x 30 x 23 cm. Large 60 x 40 x 23 cm. Rectangular tray of natural poplar wood with fences. It is ideal for making tables of sweets or decorations. Inside measurement 33x21,5x9 cm.